Pyunkang Yul Acne Line is specialised acne care line, which is inherited from Pyunkang Oriental medicine clinic's 40-year philosophy and know-how. Acne Dressing Mask Pack comprising of four square sheets fully containing essence with alleviation and antibacterial effects intensively cares for acne y closely pressed to affected areas. The Mask Pack specifically targets acne by fully moisturising the skin and forming moisture barriers, revitalising while protecting the skin from external stimuli. 01. 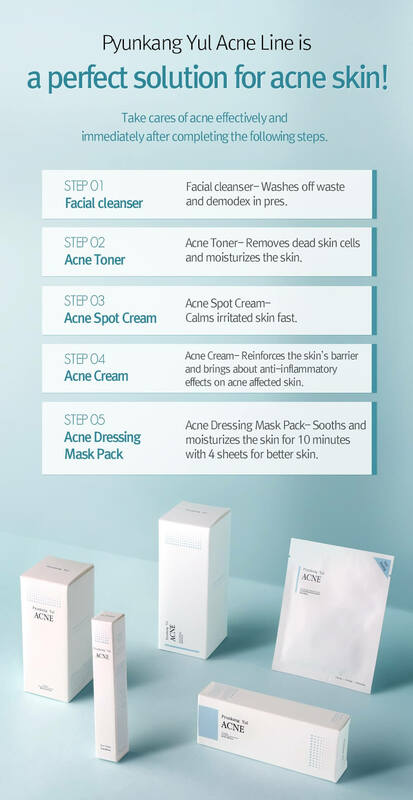 Specialised care for affected spots - When ingredients suitable for acne affected skin are absorbed into acne free areas for too long, the skin can become unbalanced. To prevent imbalance, the Pyunkang Yul Acne Dressing Mask Pack is designed to be attached to solely desired acne spots. The Pack provides specialised care and precision for treating area of acne, leaving the skin much clearer. 02. Rapid alleviation and antibacterial effects - Used as a medicinal herb in oriental medicine, white willow alleviates acne fast with its remarkable alleviation and pore management effects for acne affected skin, Another ingredient, tiger lily, which used as medicinal herb in oriental medicine, contains Matairesinol glucoside, preventing bacteria from penetrating into pores. 03. Intensive moisture - Known as Hyaluronic acid, sodium hyluronate contained in Acne Dressing Mask Pack has 6,000 times larger moisture content than general moisture factor. It strongly moisturises the skin while protecting the skin from external environment by forming a clear and thin moisture barrier.